SYRACUSE – Kem Zolman knows that he has been blessed to have such a wonderful wife during his long coaching career. Zolman’s desire to “be a better husband” to wife Lynette is one of the big reasons why he is retiring from his current coaching position. Zolman, the Wawasee High School girls basketball coach for the past 18 years, informed his team of his decision today. He shared the news with his team after Wawasee finished its season Tuesday night with a 62-34 loss to No. 4 Tippecanoe Valley in sectional play. “There’s never a right time to do this, but it’s time,” said Zolman in a phone interview this afternoon after telling his team. “I want to be a better husband. It’s come to the point the past couple of years where I just don’t feel that I’ve been a very good husband. Zolman did share his decision with Wawasee principal Mike Schmidt and athletic director Steve Wiktorowski prior to the season. The team did not know until Wednesday afternoon though. “It was much tougher than I thought,” said Zolman of telling his team. “It was one of the hardest things that I’ve had to do. It was very difficult. There were not too many dry eyes in the room. “I know that the one thing that I will miss is being with the kids. Being there with them for four years and watching them mature before your eyes as young ladies and as basketball players. I know that is what I will miss. 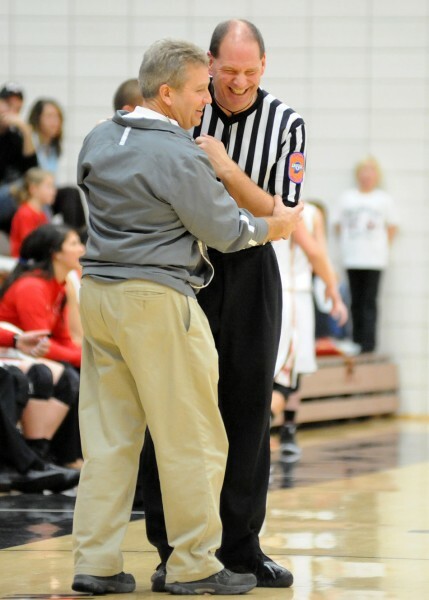 Kem Zolman shares a lighter moment with an official earlier this season. 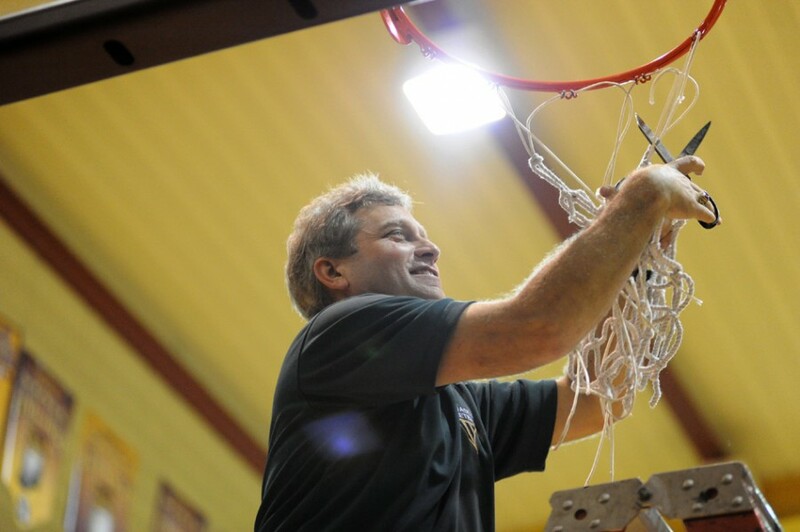 Zolman went 243-166 in 18 seasons as the Wawasee girls coach. His 2006-07 team went 22-4 and was the Class 3-A state runner-up. That team, led by junior star Taylor Goshert, lost 51-43 to Brebeuf in the state title game. The Warriors also went 23-3 in 2007-08 and won sectional and regional titles. The 2010-11 team was just 15-7, but beat rival NorthWood 24-23 in the sectional title game at Columbia City. The highlight though of Zolman’s tenure was coaching his daughter Shanna from 1998-2002. The Warriors went 74-19 during that stretch as Zolman led the state in scoring all four years at Wawasee as the Warriors played in front of packed gyms throughout the area game in and game out. She finished her career as an All-American, the state’s Miss Basketball winner and at that time the state’s all-time leading scorer for girls with 3,085 career points. Zolman went on to star at Tennessee before playing in the WNBA. She now lives in the Seattle area and works in ministry and mentoring with the Fellowship of Christian Athletes. “To coach Shanna was some highlight for me,” said Zolman. “That was the highest of highs. To see her develop as a player and become the player that she did was special. To see her break the scoring record at North Side Gym was such a memorable moment. “Our State team in 2007 was such a magical trip. To beat Elmhurst in the regional and then beat No. 1 St. Joe in the semistate (again at North Side Gym in Elkhart) was something else. And then our last sectional championship team in 2011. Zolman began his coaching career as the 7th grade boys coach at Churubusco. That first team started 0-11 and finished 2-12. Zolman came to Wawasee in 1988 and spent 10 seasons as an assistant coach with the boys program, most of those under former head coach Gary Goshert. Zolman and wife Lynette celebrated their 36th wedding anniversary in December. They have daughter Shanna and son Josh and two grandchildren, a seven-year old and a four-year old. Josh Zolman and his son made the trip up from Muncie Tuesday night to watch Kem coach his final game for the Warriors. “That meant the World to me,” said the elder Zolman, who plans to continue as a math teacher at WHS. Zolman has no immediate plans. other than quality time with his wife. Wawasee will host an open house for Kem Zolman Feb. 12 after the boys basketball home game against Goshen. Zolman will be part of a presentation at halftime of that basketball game.